“Tree-candle”, because the genus is typically treelike, arborescent, with the presence of a massive trunk. A genus of treelike plants, reaching more than 10 m high, with a thick cylindrical trunk (more than 1 m in diameter) and many branches. Branches erect or pendent, with 3 to 5 ribs, margins strongly crenate (undulate in D. undulosus). Spines rather small, aciculate, sometimes absent. irregularly reticulate, brown, covered with mucilage, possibly ornithophilous dispersion. The animal responsible for the dispersion, bird or mammal, has probably disappeared. 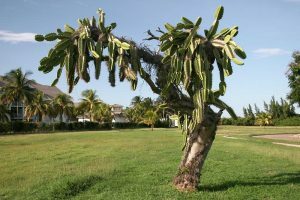 The genus Dendrocereus is insular and grows in the Caribbean islands in coastal undergrowths (maniguas) in dry tropical area, often near the sea. Dendrocereus nudiflorus is a truly endangered species, because we cannot find young specimens in the natural populations, as they do not reproduce any more. Cuba (Granma, Guantanamo, Matanzas), Haiti (northwest), Dominican Republic (Altagracia, Pedernales).